In my last article I discussed why cadences above 110 rpm in most indoor cycling classes are ineffective. Now it's time to examine the other end of the spectrum: very low cadences with very high resistance. Some instructors will ask students to load on the resistance so much so that cadence drops to 50, 40 or even 30 rpm. 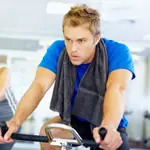 Let's take a look at whether this is beneficial for you as a cyclist, or even for the non-cyclists that make up a large part of the indoor cycling population. The term "specificity of exercise" is a tenet in exercise science that applies to all fitness and sport training. It means that as much as possible, your training should mimic the specific movement of your sport or goal activity. Specificity applies not only to the muscle groups used, but also to the speed of movement, the joint angle, the muscle fiber types recruited and even to the metabolic system employed to generate energy. In a periodized training program, training starts off fairly general to enhance basic fitness elements such as muscular endurance, aerobic endurance and leg speed (in the case of cycling), but the closer you get to your event the more specific your training needs to be. Climbing is an essential part of cycling, especially for those who live in hilly areas. What cadences are generally desirable for climbing? If your cadence consistently falls below 60 rpm for longer than a few minutes when climbing, and you are already in your lowest gear, your logical next stop should be to go to your local bike shop to purchase new gears. Cadence that slow is less efficient, causes much greater muscular fatigue, depletes your glycogen stores much more quickly, and places a tremendous risk on the knees, hips and back. Many riders in the pro peleton can be seen pedaling up the famous climbs of France, Italy and Spain at cadences in the high 80s and 90s. Alberto Contador and Juan Jose Cobo apparently used a gearing of 34x32 in their quests to win the 2011 Giro and Vuelta, respectively. This allowed them to keep their pedaling frequency from dropping too low on the monster climbs of those races. It would also save their legs for the subsequent stages. So cyclists, take a tip from the pros: do whatever it takes to pedal faster on hills and to save your knees. Realistically, pedaling slower than 55 or 60ish rpm is not going to do you any favors. Jennifer Sage is the founder of the Indoor Cycling Association and has been in the fitness industry for 30 years as a personal trainer, strength and conditioning specialist and a cycling coach. In 2008 she wrote the eBook called Keep it Real, which is targeted at cyclists to teach them how to utilize indoor cycling classes in order to maximize their training time. .